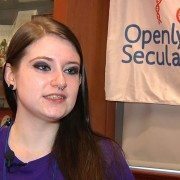 Lauren is the President of the Secular Student Alliance at her college, and she’s Openly Secular! Lauren didn’t come out as Atheist until college. Now, she tells others that they’re not alone, and helps them to open up.